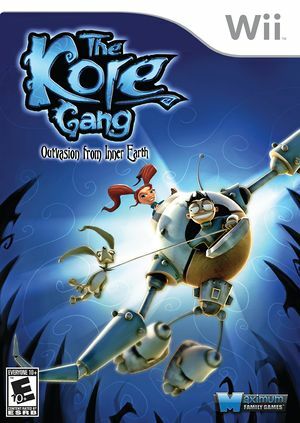 The Kore Gang: Outvasion from Inner Earth is a video game originally created by Zoink Games and developed for the Wii by SnapDragon Games. The story revolves around the characters Pixie, Madboy and the dog Rex. They must use the robotic Kore suit to stop the evil Krank brothers that started an "outvasion from inner space" to conquer Earth. The PAL version is multi-language and contains English, German, French and Spanish voices-overs. The graph below charts the compatibility with The Kore Gang: Outvasion from Inner Earth since Dolphin's 2.0 release, listing revisions only where a compatibility change occurred. This page was last edited on 16 January 2018, at 13:02.